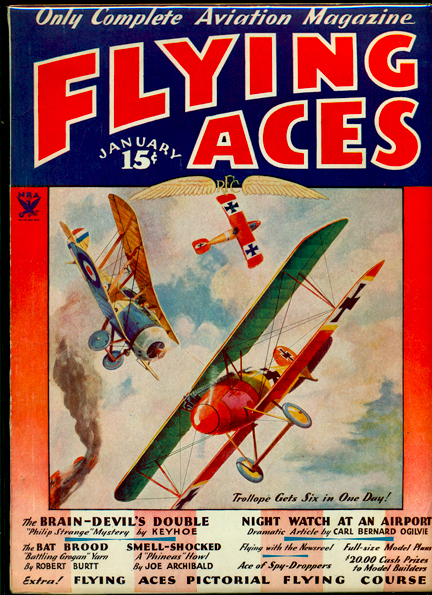 Third “bedsheet” issue of this long-running aviation pulp, which started out as a vehicle for fiction but evolved into a hobbyist magazine for model-airplane buffs. 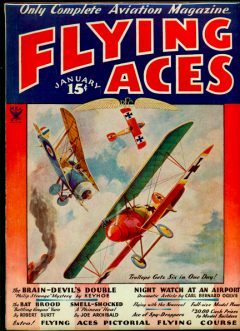 Donald Keyhoe’s Philip Strange, the Brain-Devil, was a World War One hero whose adventures were featured exclusively in Flying Aces; he clearly inspired G-8. Other recurring characters in this issue include Robert Burtt’s Battling Grogan and Joe Archibald’s comedic “Phineas.” Condition: Fine. Nice clean book, bright spine, lightly yellowed but supple pages. PRICE INCLUDES SHIPPING AND HANDLING TO DOMESTIC U. S. BUYERS. ALASKAN, HAWAIIAN, AND INTERNATIONAL BUYERS PAY EXTRA ACCORDING TO WEIGHT AND DESTINATION.